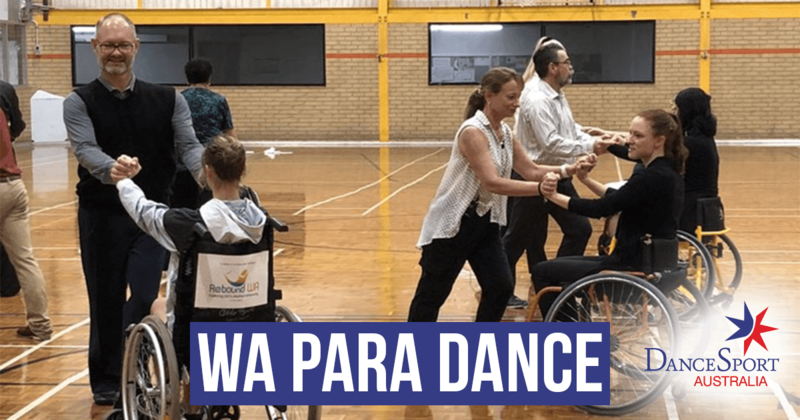 Para Dance Sport, formerly known as Wheelchair Dance Sport is a new branch of DanceSport in WA. It involves athletes who are physically impaired in the lower limbs. Their dance program is almost the same as ours but broader in some ways. Standard covers Waltz, Tango, Viennese Waltz, Slow Foxtrot and Quickstep whilst Latin includes the regular five dances: Samba, Cha Cha, Rumba, Paso Doble and Jive. Naturally New Vogue is not included, however for freestyle/showcase they extend to Hip Hop, Jazz, Cumbia, Salsa and even Ballet. The history of wheelchair dancing goes back to 1968 when one of the pioneers in Sweden, Els-Britt Larsson used the sport for recreational and rehabilitation purposes. It became popular and in 1975 competitions started in Sweden, growing in international scope throughout Europe. These days the sport is governed by the IPC (coordinated by World Para Dance) and incorporates the rules of the World Dance Sport Federation (WDSF). For more history and to get a better feel for Para Dance, check out their world website. It’s fascinating!